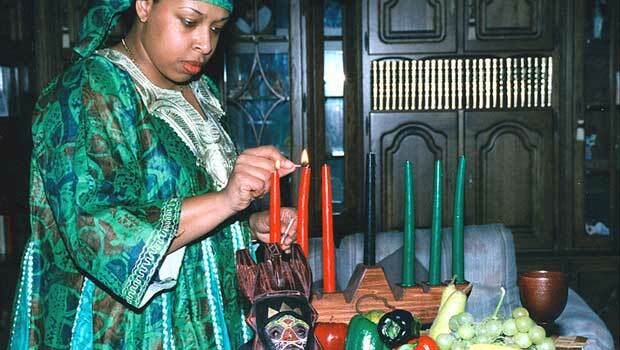 A woman celebrates Kwanzaa by lighting candles on a kinara. Kwanzaa is a weeklong celebration held in the United States that honors African heritage in African-American culture. Kwanzaa is observed from December 26th to January 1st, and culminates in gift giving and a big feast. The holiday is relatively new, compared to other holidays celebrated in the U.S. Dr. Maulana Karenga, professor and chairman of Africana Studies at California State University, first created Kwanzaa in 1966. He created this holiday in response to the Watts Riots in Los Angeles in 1965 as a way to bring African-Americans together as a community. Dr. Karenga researched African harvest celebrations and combined aspects of several different celebrations, such as those of the Ashanti and those of the Zulu, to form the foundation of Kwanzaa. The name Kwanzaa is derived from the phrase matunda ya kwanza which means first fruits, or harvest, in Swahili. Celebrations often include singing and dancing, storytelling, poetry reading, African drumming, and feasting. Dr. Karenga created seven guiding principles to be discussed during the week of Kwanzaa. The seven principles represent seven values of African culture that help build and reinforce community among African-Americans. Each day a different principle is discussed, and each day a candle is lit on the kinara (candleholder). On the first night, the center black candle is lit, and the principle of umoja, or unity is discussed. On the final day of Kwanzaa, families enjoy an African feast, called karamu. To build and maintain our community together and make our brothers' and sisters' problems our problems and solve them together. Mazao symbolizes the fruits of collective planning and work, and the resulting joy, sharing, unity and thanksgiving part of African harvest festivals. To demonstrate mazao, people place nuts, fruits, and vegetables, representing work, on the mkeka. Just as the crops stand on the mkeka, the present day stands on the past. The mkeka symbolizes the historical and traditional foundation for people to stand on and build their lives. The stalk of corn represents fertility and the idea that through children, the future hopes of the family are brought to life. One vibunzi is placed on the mat for every child in the family. Candles are ceremonial objects that serve to symbolically re-create the sun's power, as well as to provide light. There are three red candles, three green candles, and one black candle that are placed on the kinara. The kinara represents our ancestry, and the original stalk from which we came. On the sixth day of Kwanzaa, the libation ritual is performed to honor the ancestors. Every family member and guest will take a drink together as a sign of unity and remembrance. On the seventh day of Kwanzaa, gifts are given to encourage growth, achievement, and success. Handmade gifts are encouraged to promote self-determination, purpose, and creativity. Do you celebrate Kwanzaa? Which traditions do you cherish most?